Bake sardines in a pre-heated oven at 180ºC for 10 minutes. While it is baking, peel and dice the onion. Heat oil in a frying pan or wok and sauté the onion with the minced garlic. Add rice, the mixed vegetables, the turmeric powder. Stir-fry thoroughly, add raisin and the fish sauce and mix well a last time. Serve on a plate. 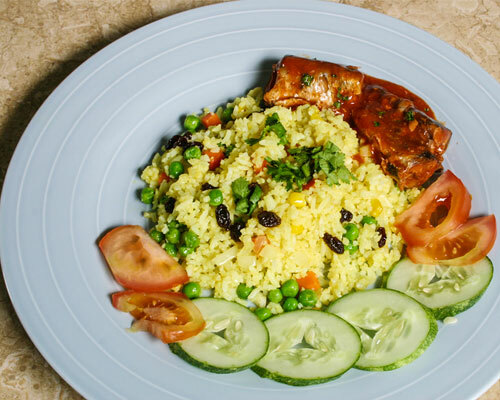 Serve the turmeric fried rice in a wide plate and garnish with cucumber, onions, tomatoes and coriander leaves. Sprinkle a bit of parsley on top of the rice and place sardines beside rice. For the final touch: pour lime juice on sardines. Comments: This traditional dish of Kashmir is packed with high quality protein derived from sardines which is required by the body for growth and maintenance of lean muscle tissue. This Natural, Healthful Food Choice is a good source of dietary fiber, including inulin that promotes digestive health. It also contains about 74% of recommended levels of bone boosting calcium derived from sardines that may also help control blood pressure, keep pre-menstrual moods on an even keel, and weight in check. Furthermore, the Curcumin from turmeric helps in reduction of Alzheimer's, heart attack, reduce cholesterol in the blood, increase the body immunity to fight against the infection and disease.